Eamon has been reunited with William but discovers that a new alien threat looms as the world gears up for war. Gleeson is trapped inside the walls of his own city and struggles to wrest power back from the people who usurped him. Rebecca looks to revenge herself on The Forsaken and free Mikey from slavery. 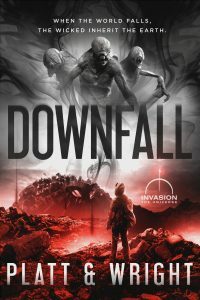 Downfall is the final book in Sean Platt and David Wright’s Stonefall trilogy set in the bestselling Invasion Universe. If you’ve enjoyed the previous books, you won’t want to miss your chance to grab the epic conclusion!